French President Francois Hollande says the Bastille Day truck attack that killed 84 and injured 100 others in Nice has all the elements of a terrorist attack. The dead attacker, named as a 31-year-old French-Tunisian who lived in Nice, has not been confirmed to be working for Islamic State. President Hollande said authorities will continue to investigate his identity. Hollande said France's state of emergency, set to end later this month, will be extended another three months and 10,000 extra military personnel will boost the ranks of security forces across the country. He said France will strengthen its roles in Syria and Iraq. 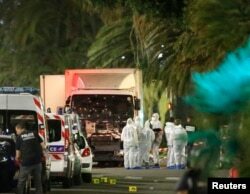 The driver steered his speeding truck into a crowd in Nice Thursday night at a celebration of Bastille Day, France's independence holiday. France's Interior Ministry put the death toll at 84 and said the driver was "neutralized," meaning he was shot to death by police. Officers later found the truck had been carrying explosives, grenades and other weapons. French news reports said the Paris prosecutor's office, which handles major terrorism cases, had been put in charge of the investigation. 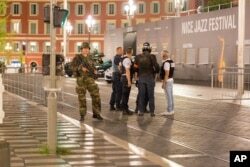 Nice, France's fifth-largest city and the capital of the Cote d'Azur region, was put on lockdown by security forces in case further attacks might be planned. A police car is parked near the scene of an attack after a truck drove on to the sidewalk and plowed through a crowd of revelers who'd gathered to watch the fireworks in the French resort city of Nice, southern France, Friday, July 15, 2016. Government officials in Nice said many police officers were among the dead. At least 18 of the survivors were said to be in critical condition. “I went to bed and started to hear people screaming and I saw people running, running, running, police, people crying, people screaming," said VOA producer Linda Ringe who was staying in a hotel overlooking the Promenade des Anglais where the attack took place. “We went downstairs and crossed the street and there were many many bodies and we knew they were dead because they were covered with sheets. Many people were trying to tend to those wounded but so many were dead. People were crying and screaming..."
She said the truck continued through the promenade, which is a pedestrian street, until the driver was killed by police. Ringe said at 7 a.m., hours after the attack, she could still see several bodies covered with sheets from her window. President Barack Obama condemned the "horrific terrorist attack" and the slaughter of innocent civilians, and he directed U.S. officials to offer all assistance possible to French authorities. "On this Bastille Day," the U.S. leader added, "we are reminded of the extraordinary resilience and democratic values that have made France an inspiration to the entire world, and we know that the character of the French Republic will endure long after this devastating and tragic loss of life." Secretary of State John Kerry said the U.S. Embassy in Paris was working to account for the welfare of U.S. citizens in Nice. The American consulate in Marseille said it was trying to "determine if any U.S. citizens were injured in the event." U.S. Democratic presidential candidate Hillary Clinton said the attack made her "sick at heart." Her Republican opponent, Donald Trump, called the attack "horrible" and said he was postponing plans to announce his vice presidential running mate on Friday. French police said they were checking to see whether anyone else at the scene might have been involved in the plot. 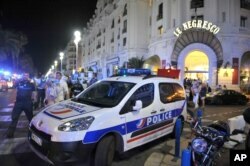 Video from Nice showed armed police vainly chasing the truck on foot as it raced along a seaside promenade, running down people who had been heading home after a Bastille Day fireworks display. The truck's windshield was punctured by a volley of bullets, apparently fired by police, but some witnesses said the driver opened fire before he set out on his fatal ride along a two-kilometer stretch of pavement. Police officers and a soldier stand by the sealed off area of an attack after a truck drove on to the sidewalk and plowed through a crowd of revelers who'd gathered to watch the fireworks in the resort city of Nice, southern France, July 15, 2016. The lobby of a nearby luxury hotel was transformed into an emergency treatment center for the shocked and injured, and all hospitals in the Nice area were put on alert to receive the injured. Witnesses said they were sure the carnage was deliberate, on a street that was closed to traffic at the time. The driver crashed through a barrier to enter the pedestrian zone, then steered a zigzag course through the crowd, accelerating as he bore down on clusters of people trying to flee. Metal panels at the front of the truck, which appeared to be either a freight carrier or a moving van, were crumpled by the force of the impact when it rammed into people running for their lives. Thursday's slaughter was the third major terrorist attack in France since last year. A coordinated attack in Paris on November 13 killed at least 130 people in a terror strike claimed by Islamic State, and a series of attacks in January 2015 that began with an assault on the offices of the satirical magazine Charlie Hebdo killed 17 people. French police force and forensic officers early Friday look at the truck that ran into a crowd celebrating the Bastille Day national holiday in Nice, France, July 14, 2016.